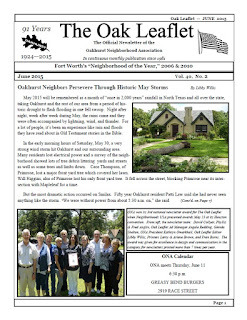 Oakhurst Neighborhood Association, Fort Worth, Texas: June Oak Leaflet Now Online! Check out this month's issue of The Oak Leaflet online! This issue recaps May's record-breaking weather and the ONA Memorial Day Weekend garage sale, showcases June's Yard of the Month, offers information on handling mosquitos, and even features articles on the Daisy Lane Aircraft Company (David Martin) and Channel 11's Storm Center studio (Mary Claire Hall). This Saturday: ONA July 4th Parade and Picnic!